The year 2013 is coming to an end, and in the next few weeks, the internet will be bombarded with a several “best of lists” articles, mentioning applications, mobiles, gadgets and what not for the year ending 31st December, 2013. 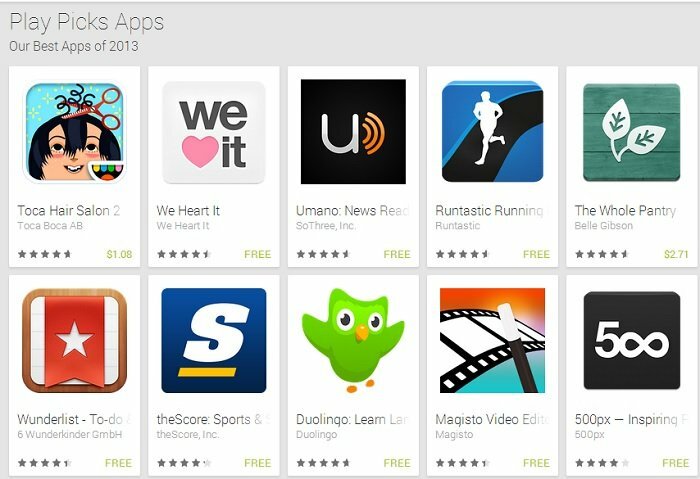 If you’re an Android user, Google has compiled a list of best apps of 2013. The list includes some popular applications such as Duolingo, theScore, 500px, Taco Hair Salon, We Heart It, Umano, Circa News, The Whole Pantry, Runtastic Running, Wunderlist, Magisto Video Editor, TuneIn Radio and Photo Editor by Aviary. Although we don’t know what factors Google took into consideration when compiling the list. It may not be the best list for every Android user out there, but it contains a bunch of useful applications.Interestingly, it also includes a few paid applications while a majority of them are free. Developers released a bunch of useful and interesting applications earlier this year, which should have been a part of the list, but there’s nothing we can do about it. We’ll have to wait for the blogosphere to come up with its own list of applications that it considers best. Which is your favorite Android application for the year 2013? Share with us using the comments below.